This piece is about Commodity Racism - the act of using product branding to promote racist ideologies. In putting this together I drew on the works of McClintock (Imperial Leather) and Stuart Hall (Representation). You can find links to these books here. “Power needs a discourse to exercise its authority, to justify itself, to universalize its values and legitimize its doing”. By the nineteenth century when European Colonialism began in full swing, Africa was regarded as a land of barbarism - home to cannibals and witch doctors. This marked a shift in the way that Africans were depicted globally. Essentially, the West needed to depict Africa and its people as being ‘uncivilized, evil and barbaric’ as a way to justify their exploitation in order to meet economic needs. Now real barbaric acts such as slavery, colonialism came to be seen as moral. This is where Commodity Racism truly sprang into play. Commodity Racism is the act of using product branding to communicate racist ideologies. Essentially, the British Empire’s ‘Colonial Conquests’ were introduced to popular culture through brand advertisements. Primarily, this served two purposes. Strengthening the image of the British Empire as a global leader. And as previously introduced, it also was a means of justifying the barbarism of the Empire’s colonial endeavours. Semiotics helped to turn these commodities into symbols that could effectively promote these messages. Imagery and language were used as binary oppositions that reinforced the idea of white supremacy. In his book ‘Black Skins, White Masks, Fanon identified the problem with using this type of language. He points out that in Roget’s dictionary, you can find 134 synonyms for whiteness, all of which hold positive connotations, while all of the 120 synonyms for blackness are steeped in negativity. Whiteness was associated with purity and black became synonymous with evil. Commodity Racism, aggressively employed these oppositions and put them to work to communicate the imaged superiority of Empire and its subsequent civilizing mission. The Civilizing Mission was an Imperialist Narrative that attempted to rewrite the horrors of colonialism and reframe it as a ‘moral obligation’ to civilize the dark savages of the world. To successfully spread this narrative, branded goods became ‘galleries’ for the stories of ‘Colonial Heroes’ who ventured into the ‘Darkest Africa’ - the Uncivilized Lands. Many of these goods included domestic items such as Soap, Matches and Toothpaste Pots. This enabled these racist messages to enter people’s homes. According to McClintock, no previous form of organized racism had been able to reach so much of the masses. Among the range of products that were used in these campaigns, soap served as the perfect metaphor for the British Empire’s mission. As McClintock observed, the object became imbued with ‘magical fetish powers’. And these magical properties had the power to transform black into white and to brighten the darkest corners of the world. One of the leading products within the Commodity Racism epidemic was Pears’ Soap. In one of their soap ads ‘before soap’ and ‘after soap’ images were used to deliver this message. In the first image a black child is in the bath (which is depicted as a foreign environment) and is about to be washed by the white child. The second frame shows the white boy holding a mirror for the black boy so that he can see his new reflection following his first contact with this magical soap. The black boy's body is now, by the miracle of soap, white. And he is clearly pleased with his transformation. But while his body is now white, his face remains black – a picture that, perhaps, sends an important message. According to McClintock’s analysis - it’s possible that this incomplete transformation suggests that the ‘black savage’ can never become as civilized as the white man. But he will find a reward in the attempt. Pears proved that the use of soap could powerfully promote ideas such as cleansing the unwashed and clothing the savage, which, in turn, blended with the notion that white was right and symbolic of enlightenment. This was particularly ironic, since Europeans had only recently been introduced to soap at this time. And to add another punch, Europeans were introduced to soap via African people - for whom it was a natural part of life. It’s important to consider the significance of the fact that brand advertisements are still regularly racialized in modern society. In particular, between 2011 and 2018 there appears to have been a sharp rise in the recognition of these types of brand campaigns. For many, whether these controversial campaigns are intentional or unintentional in their racism is often up for debate. 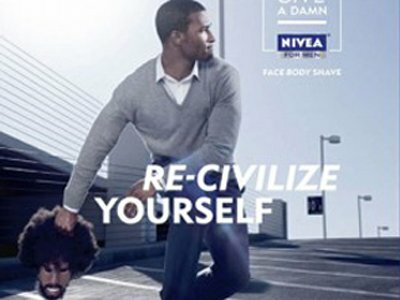 But for a moment, let’s take it back to 2011 when Nivea received major backlash after launching their brand campaign “Look Like You Give a Damn”... which ordered a black man to 're-civilize' himself by disowning his afro hair. In the ad, a black man with a newly shaven head is holding his former head (which sports an afro) and is preparing to throw it into the distance. Knowing the history of brand advertisements and the Civilizing Mission, the controversy of this brand campaign takes on a new level of significance. During that same year (2011) Dove’s brand campaign 'Visible Care' revived history with a Pears' type message. According to Gawker, the campaign which promised 'visibly more beautiful skin' suggested that the value of their soap was found in its magical ability to 'turn black women white'. Aside from the obvious problems with the campaign itself, it could be argued that what makes this even more problematic is that Dove is owned by Unilever - the same company that also owns Pears (previous Nineteenth Century Commdity Racism pioneer). And as sister brands, this Unilever tag team ensured that the idea that white is a sign of purity, status and beauty continued to exist in modern society. Interestingly, these brand campaigns are still often written off as ‘careless mistakes’ by the brands themselves, and also many consumers. The question is, how and why, for example, has Unilever been making the same ‘mistakes’ for over 100 years? And why do many of the other culprits keep repeat offending? After facing such widespread backlash, it would be reasonable to assume that brands would employ more rigorous means to avoid making the same mistake twice - or in some of these cases - repetitively. The key message here is, things could be better. And education is the key. Let’s remember that ‘communication’ shapes ideology and ideology shapes society - not just how we think, but also how we behave toward one another.